Alt Art School Weekender flyer by Laura Adamson (TOMA). 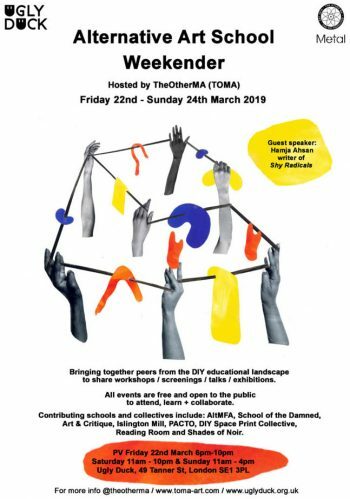 Join us for the first installment of the radical pedagogy research group, we will address the first question in the draft reading list “What is alternative art education? Who is it for and what is it alternative to?” Please find the download links below. We will also discuss the topics that came up at the launch event on Friday, 22 Feb, including introductions, practical outcomes, the programme for upcoming sessions, timing and how we will communicate.